Muse: The Brain Sensing Headband - DON'T BUY BEFORE YOU READ! MUSE 2 IS IN STOCK NOW!!! It’s smaller, lighter, and has more features. Click here to see the best price online right now. Click Here For Today's Best Price! Scroll Down To See My Price Comparisons! Muse 2 introduces 3 new types of meditation through the app. The new tech helps you focus on stillness, heart rate, and breathing. It’s early days so there aren’t that many different exercises. But don’t worry. The manufacturer, a company called InteraXon, is going to roll out more and more. They bought a content creation lab called Meditation Studio in July 2018 so it’s fair to say they plan on making sure there’s plenty of quality material in the pipeline for Muse 2. I’m sure you already know about the amazing effects of meditation on your mind. In study after study (thousands of studies) its been proven effective as an excellent remedy for anxiety. There are so many different types of meditation and apps to go along with them. It can be confusing to figure out which one to use. On top of that it can sometimes be hard to stick with your meditation schedule even though you know its what you need to do to feel better. We all sometimes face a similar road block when it comes to working out consistently. Well luckily for us there’s now a new super cool high-tech way to meditate and stick with it. Muse is a wearable brain sensing headband. It measures your brains activity using EEG (Electroencephalography) sensors. The app that comes with the device converts the EEG signals into audio feedback to the user via the built-in headphones. The headband helps you to reach a deep guided relaxation state by playing different sounds to you while you meditate. For example: When you are in a more relaxed state you can hear the sound of birds. When you’re in a state of higher brain activity you can hear storm sounds. You can also choose what environment you’d like to be in. You can hear your mind as the wind in the desert, waves on the beach, or rain in a forest. Its also possible to meditate with no sounds and simply track your mind via the headband. You’ll then be able to see spikes in the graph of where you were dealing with an annoying thought or where you lost focus. You can choose to do short 3 minute sessions per day all the way to more than 1 hour. It has built in LED lights that let you know when its charged, charging, pairing and paired. You can adjust the difficulty level and that will change how often the sounds change. Give full guidance that walks you through how to meditate and what the sounds of your mind mean. The cool thing about the app is that you also get points and it makes it fun so you want to meditate more often. Whats the difference between traditional meditation and Muse? The main idea behind the Muse is that instead of waiting a certain number of minutes before realizing that you’ve wandered off- which occurs in traditional meditation, the Muse is active meditation. It lets you know within milliseconds so you can bring your focus back. This is like going to the gym for your brain because you’ll get better and better and staying focused during a session. This also allows you to bring your focus back many more times in a Muse session than is possible in traditional meditation session. The Muse is a supercharged meditation that’s fun to do and easy to stick with. How does Muse make meditation easier? Muse guides you and teaches you the essentials of focused attention meditation. There are points and milestones which motivate you to keep at it. Graphs at the end of each session shows you the progress you are making. Its a lot of fun to use, and you see results very quickly. Muse lets you share your device with family and friends and setup multiple accounts. 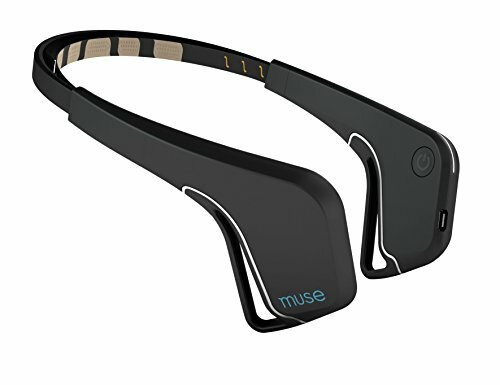 The Muse Brain Sensing headband works through EEG- Neurofeedback technology. It measures your brains activity using EEG (Electroencephalography) sensors. It uses 7 finely tuned sensors: 2 Sensors on the forehead, 2 behind the ear sensors, and 3 reference sensors. All 7 sensors measure the activity in your brain. Muse has been tested and certified in the USA, Canada, and Europe and abides by regulatory standards in each place. The measurements taken by the sensors in the Muse device do not cause any harm. Brain sensing technology like EEG is used and has been used widely in hospitals and institutions for over a century. Muse sends the information it collects via bluetooth to your phone app. Bluetooth is considered safe as it only outputs 1/100th of the power of a normal cellular phone signal (radio waves). What are some potential problems with Muse? Some people have said that they have to adjust the headband a lot and its sometimes only works when its uncomfortably tight for them. However the majority of people say its soft to the skin and flexible and light, and i comfortable to wear. Small head movements can loosen the sensors and cause a loss of signal, so you have to sit quite still when using Muse. Though Muse is affordable its not cheap. I think that if it works for you its alot less expensive than other forms of therapy. And if it gets you to meditate its totally worth it. Some people are saying that Muse isn’t accurate all the time. The point they are trying to make is that Muse really can’t tell all that well whether your brain state is calm or active. But, these comments are coming mostly from people that already have been meditating for many years. So really I think the Muse is aimed at those who haven’t meditated and who need some guidance and feedback to get started. There have been complaints that the Muse app takes a bit too long to start, and that there are some issues with the bluetooth connection dropping out during sessions. I’m betting that this will be fixed with software updates in the future. Muse is not approved as a medical device but rather as a wellness device. What exactly is Muse measuring and what research is behind it? Setting up Muse with the Muse App is very easy. You can download the app for iPhone and Android phones. Once you’ve downloaded the app you connect the app through your Bluetooth settings. Once that is completed you don’t have to do that again. It will automatically pair to your phone if your Bluetooth is on. The app has a built in tutorial which takes you through the setup process. You will learn how to adjust the headband to make sure it fits comfortably and so that it is positioned in the right way to pick up your brain waves. You’ll need to calibrate Muse through the app every time you use it. Thats because your brain is slightly different every day and Muse needs to have a baseline which it gets from a snapshot of your brain during calibration. Now you’re ready to meditate! Muse will give you real time feedback about your brain signals. If your mind is calm you’ll hear corresponding calm sounds and when it is active you’l hear the sounds change to less calm sounds. That way you can know immediately that you’re losing focus and bring your focus back to the calm state. The Muse App is an excellent tool for tracking your profess and understanding your results. What can you see with the Muse app? You’ll be able to see a percentage of the time your brain was in a calm state in each session. The calmer you are the more birds you’ll hear in the real time feedback sounds. The app calculates points for your meditation sessions. You receive a point for every second that you have stayed in a neutral state and three points for every second your brain remains in the calm state. After 5,000 points you can unlock other stats and graphs like “insights about you” and “timeline view”. In the Insights about you section you’ll find out what time of day you are generally calmer. The calmer you are the more birds you earn. Once you’ve completed a sessions with Muse, the app will show you how you did. There are charts and graphs that track your progress over time and you get points as you move along that unlock other features in the app. The charts are easy to understand. You’ll be able to see how long you were calm during the session and the app will give you tips on how to improve your future sessions. Track your progress and meet your goals. All of your results are saved in your private account. The Muse app allows your to follow your progress over time. Its fun and easy to stay motivated with your Muse as it gives you: goals, points, challenges, and bonuses. Every session earns you points and this helps you feel rewarded and stay interested. The benefits of focused attention meditation and training are numerous. This is backed by a lot of research. The benefits you receive grow over time. What is the Science behind Muse? The idea here is that Muse can give you real feedback of your brain activity. This Neurofeedback is a technique that has been used by mental health professionals for more than ten years. They traditionally would use sensors that connect to a EEG recording device to a laptop of desktop computer. Through the use of operant conditioning (a type of learning) the techniques attempt to alter brain waves by giving feedback about the EEG rhythms to the patient. Muse does this automatically with changes to the sounds you hear on the device in real time. The idea is that with emphasis placed on focused attention a decrease in certain brain waves (theta waves) and an increase in other brain waves (alpha waves) would be beneficial to the patient. Its thought that more alpha waves are associated with better focus and attention and a feeling of calmness and well-being. So that’s all the science but the fact is there are people that say it isn’t beneficial for them. There is still some debate about the science. Its not 100% clear that better EEG rythms can beat clinical depression and anxiety but there’s plenty of studies that show it does help. To be fair you could say that about almost every form of therapy. It just doesn’t work for some people. Accupuncture for example isn’t for everybody, but there are millions of people who swear by it. You really have to try it to find out if it works for you. When you buy the Muse you can try it and see if you like it, and if you don’t you can return it. Make sure to check the vendors return policy. How Will you Feel after your Muse Sessions? Most people say that they feel a lot calmer after their Muse sessions. Having the real-time feedback allows you to train yourself to change your thoughts away from what is distracting or annoying you and to focus once again on the meditation. Focusing back on your breathing once you know you are drifting or distracted is a great tool for improving your wellbeing. There’s really no meditation time wasted- because with Muse you are super-charging the meditation and you’ll immediately know when you need to focus. So with Muse you’ll likely get results from meditating much faster than without muse. Although any meditation is likely to help, this is a great device to get on track to managing your anxiety. The Muse Brain Sensing Headband is an innovative well designed device that can really get you in the mood to meditate. Most of the people that have tried it love it and it shows great promising results in improving numerous conditions especially anxiety. If you’re like me and have a hard time staying committed to going to the gym or to meditating we need all the help we can get! This device keeps you interested in the meditation journey and fast tracks your brains ability to focus and achieve a sense of calm. You’ll also notice an improvement in other cognitive functions in your day to day life. I really like the other feature of the Muse headband. Being able to meditate and just track your brain waves without using the real time feedback means you can meditate normally as well. And afterwards you can see how your brain waves are improving over time. You’ll be able to see how much better you are getting at keeping focus and keeping the attention away from annoying thoughts. Overal the Muse is an affordable useful tool for improving your well being. Setup is fairly simple. Its great to have the Muse on your side to motivate you with rewards, charts and feedback. I hope you enjoyed this report and enjoy using the Muse Brain Sensing Headband. Want to know more about Muse and EEG?